Kerberos has some advantages over NTLM. 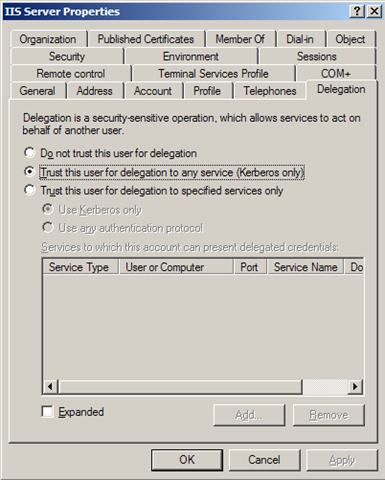 Only with Kerberos it is possible to pass the client credentials (meaning the user who logged himself on to the SharePoint website) to another server. This is important, if you use e.g. my Fileserver Access Webpart and configure it to a share on a server, which is not your SharePoint Server. If you want to know more about Kerberos, you can look at Kerberos Explained on the Microsoft Technet pages. You will also need Kerberos, if you want to connect to a SQL Database with the user account (Reporting Services). So what do we do about it? 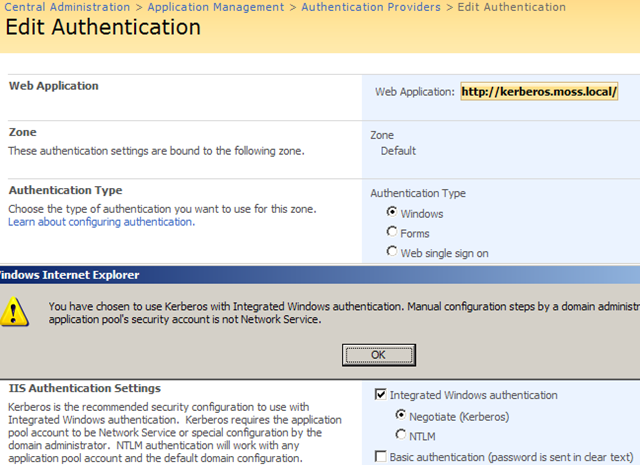 Well, lets add Kerberos Support for an existing SharePoint WebApplication. This will be http://kerberos.moss.local for this demo. 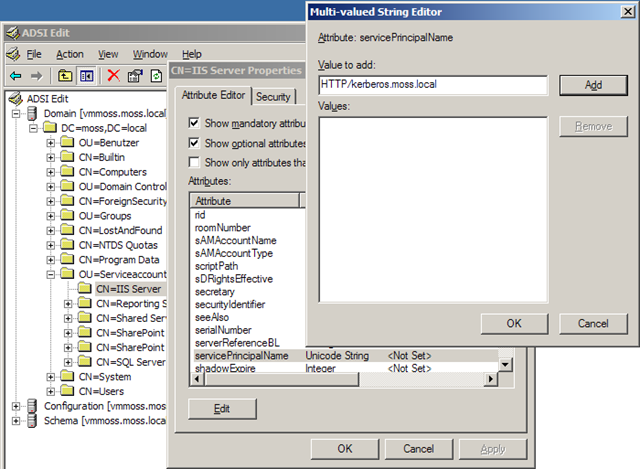 The existing WebApplication / IIS Virtual Directory is configured for NTLM. We can find out the current settings by going to the "Central Administration", "Application Management". Here we click "Authentication providers". The account, which the Application Pool uses, should be a domain account! 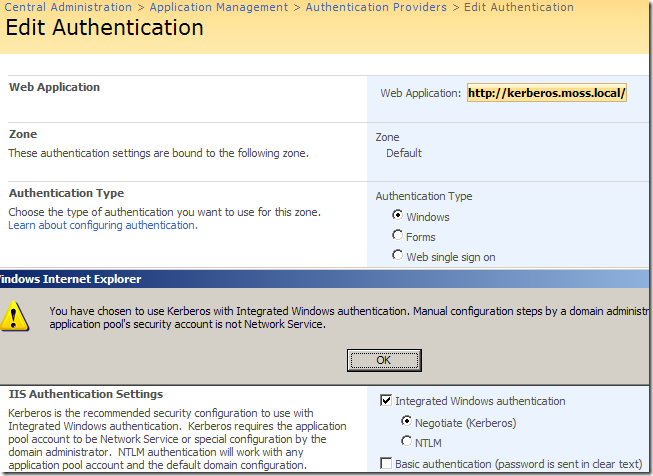 KB215383 describes how to configure Kerberos. First you have to find the ID of your Web Application in the "Internet Information Services Manager". In my case this ID is 978677539. To change the Authentication settings, you need the ADSUtil.vbs script, which is usually in "C:\Inetpub\Adminscripts". cscript adsutil.vbs set w3svc/978677539/root/NTAuthenticationProviders "Negotiate,NTLM"
Open up the ADSI Console to be able to add a Service Principal Name easily. 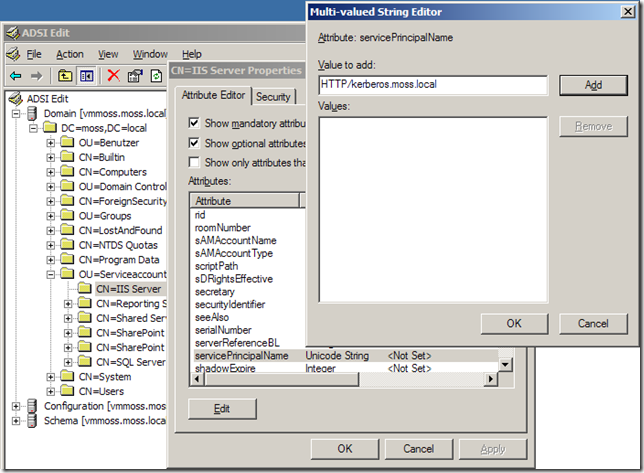 When you open "ADSI Edit", you will need to navigate to the service account. Right click it, and look for "servicePrincipalName". Then add "HTTP/kerberos.moss.local". Yes, only one slash and no ":". Note: Even if you’ve used “http://kerberos” as hostheader, you’ll need to provide the FQDN as SPN! 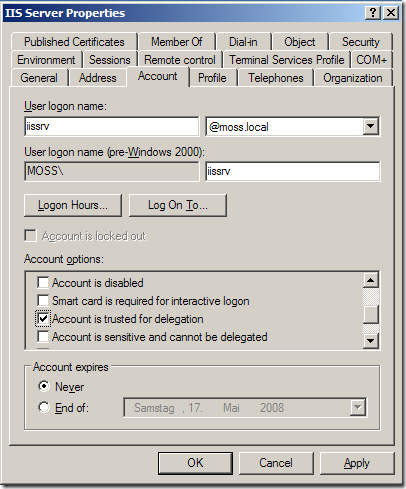 So in this example the hostheader would be “http://kerberos”, and the domain of the SharePoint server would be “moss.local”. Depending on your domain operational level, you will get different points, where to activate delegation. With a native Windows 2000 domain functional level, the delegation option is under your Account tab. 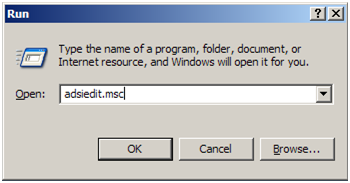 With a Windows Server 2003 domain functional level, you will get an extra tab within the Active Directory Object properties dialog. Delegation means, that this account may act on behave of other users. You can disable this for your Admin Accounts, if you wish so. Enable the "Account is trusted for delegation" option for your Application Pool Account. Just beneath this option, you see "Account is sensitive and cannot be delegated". This settings can be set on important accounts like your Enterprise Administrator. In your Central Administration go to "Application Management" and click "Authentication Providers". 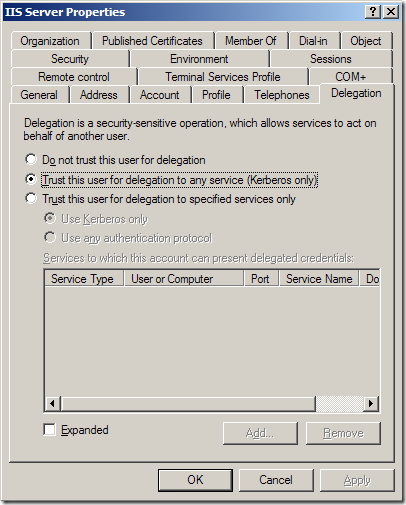 After you have selected your Web Application, you can enable Kerberos. To be honest I don’t know why this example did not work in my testenvironment. 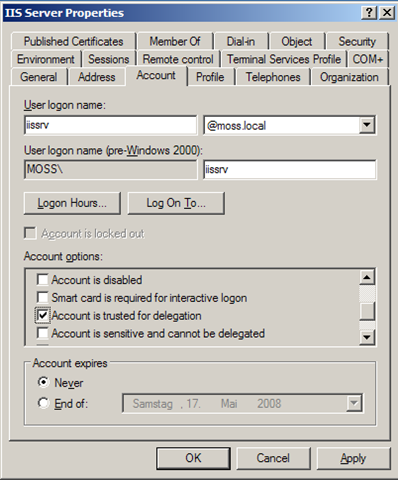 I had to use the DNS name of my SharePoint Server instead of "kerberos.moss.local" as servicePrincipalName. How did I find out? Well, I could not call the website from my client. The browser gave a 401 error, when I tried to call the SharePoint site. In the eventlog of my client I found that it was connecting to my DNS name, instead of kerberos.moss.local. So if you experience a similar problem, look in the security log of your client, and adjust the servicePrincipalName accordingly. An explanation for the weired SPN if found a great post. It says that depending on your DNS record, the FQDN or servername will be checked for the SPN. Meaning: DNS goes to a cname, that cname will be resolved to an a record. And that one is used for Kerberos.